(0 Customer Reviews) | Write Review 6 issues per year Quilters Companion is the definitive patchwork and quilting magazine. With a wide range of styles displayed as they should be, in a beautiful home environment, Quilters Companion is bound to leave you with an abundance of ideas and the desire to create some stunning quilted pieces for your family and friends. With the talented Clare Mooney at the helm, this 140-page (plus pattern sheet) publication is the market leader in its specialty field. Get some advice from your best friend in quilting: Quilters Companion. Quilters Companion’s Modern Quilts recognises the new movement in quilting and showcases an innovative attitude and approach to quilt-making. Even though the design roots might seem quite traditional, many have been reinterpreted to take a different spin on the blocks and techniques of these designs. The projects featured in Modern Quilts are gathered from the leading modern quilters both in Australia and overseas. Several of the most recognised quilters in the movement, Denyse Schmidt, Weeks Ringle and Bill Kerr, have been interviewed for the launch issue. 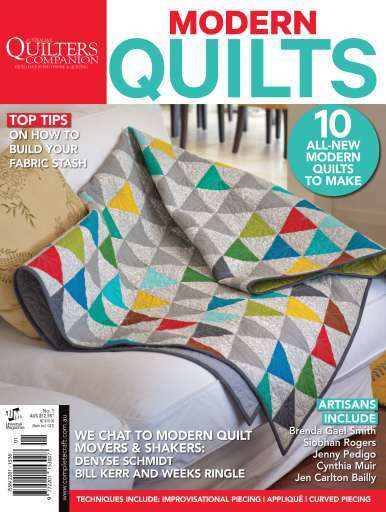 Modern Quilts is a supplementary to the Quilters Companion subscription and is the perfect read for all enthusiasts. 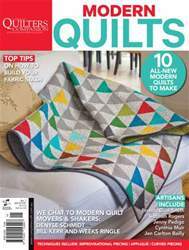 Quilters Companion is the definitive patchwork and quilting magazine. With a wide range of styles displayed as they should be, in a beautiful home environment, Quilters Companion is bound to leave you with an abundance of ideas and the desire to create some stunning quilted pieces for your family and friends. With the talented Clare Mooney at the helm, this 140-page (plus pattern sheet) publication is the market leader in its specialty field. Get some advice from your best friend in quilting: Quilters Companion. You'll receive 6 issues during a 1 year Quilters Companion magazine subscription. You'll receive 6 issues during a 1 year Quilters Companion magazine print subscription.